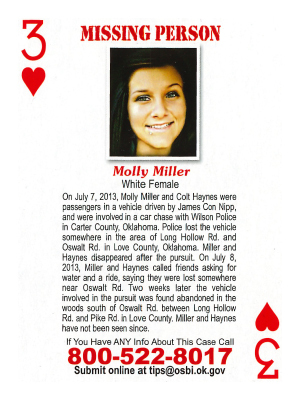 On July 7, 2013, Molly Miller and Colt Haynes were passengers in a vehicle driven by James Con Nipp, and were involved in a car chase with Wilson Police in Carter County, Oklahoma. Police lost the vehicle somewhere in the area of Long Hollow Rd. and Oswalt Rd in Love County, Oklahoma. Miller and Haynes disappeared after the pursuit. On July 8, 2013, Miller and Haynes called friends asking for water and a ride, saying they were lost somewhere near Oswalt Rd. Two weeks later the vehicle involved in the pursuit was found abandoned in the woods south of Oswalt Rd. between Long Hollow Rd. and Pike Rd. in Love County. Miller and Haynes have not bee seen since.